Hello again, it’s Don Milne to guide you on Roadtrip-'62 ™ as we begin our twenty-first day of travel along historic US-6. Yesterday, we covered 66 miles from Princeton, Illinois to the Quad Cities area, ending at Davenport, Iowa. We probably also put on another 20 miles driving around Moline, Davenport, Rock Island, and Bettendorf: the Quad Cities. There was a lot to see there and we’re not done yet! Today we leave the big city, but we’ll end at another tonight. As usual, that means museums, architecture, and we’ll also find a few surprises along the way. If you see anything you like, get yourself out on the road and enjoy it in person. While this virtual roadtrip is fun, there’s nothing like the real thing! At any time, click on an underlined word below to learn more about the places on the trip. Let’s get back on the road again! After a quick breakfast, it’s time to see Davenport, Iowa today. Davenport is the largest of the Quad Cities, and was in 1962 also. A big city has a big public park, and Davenport has its Fejérváry Park. Today the park has a Family Aquatic Center with a splash/spray area and water slide, but little else other than picnic areas. But in 1962 Fejérváry Park was famous for its Mother Goose Land! The park property was given to the city by a daughter of Nicholas Fejérváry, a Hungarian nobleman who came to Davenport in 1853. He came as a refugee from a failed insurrection in Hungary. The park is his former estate, which he chose because the view of the Mississippi River reminded him of his home on the Danube River. The house is now gone, as is Mother Goose Land and the municipal zoo that was added to the park in 1909. But we would have seen Mother Goose Land, which you entered through a giant concrete Mother Goose. To the 2,000 to 3,600 that visited on most Sundays, passing through Mother Goose seemed like there was magic waiting for you on the other side. Mother Goose Land was part of the municipal zoo, but also much more. In addition to Mother Goose, there were 30 other nursery story concrete sculptures including the towers of a drawbridge, a seashell-shaped wishing area, and Humpty Dumpty perched upon his wall. You could climb into the Crooked House, ring a school bell, and climb in and out of Indian Joe’s cave! Children could also ride live burros on The Western Trail around the upper rim of the area, which was a new feature in 1959. Along the trail were kid-sized versions of western buildings like a trading post, gold panning area, covered wagon, hotel, and a teepee. About 30 animals were housed here each summer and returned to owners for the winters. Animals included The Three Little Pigs, Monkey Island, lambs, goats, guinea pigs and even a buffalo. Fejérváry Park officials reported that young animals were preferred because the kids reacted best with them. And all this fun for only 15 cents per person! Attendance declined at Mother Goose Land throughout the 1970s, as people began to expect more from zoos and other tourist attractions. The original Monkey Island display housed the monkeys in a den under the island in the winter, which no longer met US Department of Agriculture regulations. Monkey Island was closed in 1978 and was completely demolished and redeveloped in the early 1980s with the new techniques of an artificial rock landscape and a separate building for winter quarters. City decline, with several manufacturing plants closing in the area in the 1980s, also contributed to the end of Mother Goose Land. Money became tight and Fejérváry Park Zoo fell into a period of inadequate maintenance. The zoo concept was changed to a North American Wildlife zoo in the 1990s, with Monkey Island becoming Cougar Island and Mother Goose Land disappearing. The zoo closed altogether in 2008. After we’re done at the park, let’s cross the street to the Putnam Museum of History and Natural Science. The Putnam was founded in 1867 and was one of the first museums west of the Mississippi. It sits at the top of a hill and has had so many additions, I couldn’t see the original building from the streets! Perhaps it’s in there somewhere. The museum has dioramas of animals from around the world: you can see animals typical to your own backyard in one display and animals from Africa or the Arctic just a few steps away. The Putnam is home to over 170,000 artifacts and specimens, from the Archeology of Egypt, to Asia and the Americas, all in five exhibit halls. But it also has some modern features in the newer wings. You can come face-to-face with live Mississippi River fish in their 718-gallon aquarium or watch a movie in grand style in their IMAX theater. Why, you even get a chance to remember the good ol’ days of mining for gold at Mother Goose Land! You can buy bags of mining rough (rocks and soil) in the Museum Store. You’ll have to take it home to prospect though, so it’s not quite the same. A somewhat smaller and more unusual museum is the Palmer Museum of Chiropractic History on the campus of the Palmer College of Chiropractic. The college was founded in 1897, renamed in 1961, and is the birthplace of chiropractic medicine. The exhibits are located throughout the Palmer campus and are free for the public to view, though donations are accepted. Many of the exhibits on the Davenport, Iowa campus are located in the lower level of Vickie Anne Palmer Hall. In case you’re not familiar with it, Chiropractic is a type of medical care that uses spinal adjustments to correct misalignments in the spine, which helps to restore proper function to the nervous system. This helps your body to heal naturally, and therefore Chiropractic doesn’t use drugs or surgery. The system was first discovered and popularized by Daniel David Palmer, who had moved to Davenport about 1880 and first practiced a form of magnetic healing. One exhibit at the school is a re-creation of Mr. Palmer’s Office. Chiropractic was further developed by two more generations of Palmers here at the school. After our museum morning, it’s time to find lunch. I don’t need to look far for a good, old-fashioned restaurant. Riefe’s Restaurant is less than a mile from the Putnam Museum and has been since 1946. Riefe’s began as a small drive-in but it was demolished in 1960, when a new, full-service restaurant was built on the site. It’s had three building additions since, and in addition to sit-down service they still do car hop service in the evenings! There are a lot of burgers on the menu, so my choice will be difficult. The drinks menu has something unusual: an old-fashioned soda fountain drink called a phosphate. Riefe’s flavors are cherry, strawberry, vanilla, or Green River (whatever that is). Phosphates are a drink that balances a sweet fruit flavor with a tangy or sour taste. They are made with phosphoric acid, the same as most colas contain. As an alternate, you could try the Village Inn nearby. I discussed this restaurant chain back in Euclid, Ohio and it meets our age criteria too. There’s still more to see in Davenport, but we need to get on the road. So I’ll leave the Figge Art Museum, West Lake Park, Petersen Memorial Music Pavilion, Mississippi Valley Fair, and the Adler Theatre for a future Roadtrip-‘62 ™ US-61 journey. Highway US-61, which we also crossed yesterday in Bettendorf, runs about 1,400 miles from Wyoming, Minnesota to New Orleans, Louisiana. Because most of the route follows the Mississippi River, it is also known as the Great River Road. Before 1991, US-61 continued north from Wyoming through Duluth, Minnesota and then along the scenic Lake Superior shore to the Canadian border. The highway has been immortalized in the title of a blues song recorded in 1957 by Sunnyland Slim. Back to US-6 we go, and resume our westward journey. The road through Iowa was originally constructed in a marathon on July 2, 1910. On that date, more than 10,000 farmers and others worked to build this road across Iowa in an hour. I’m guessing that the one hour timeframe is somewhat of an exaggeration! Thousands of picks and shovels and scrapers carved through hills and built the roadbed. Hundreds of small bridges were built. At the time, the project was hailed by newspapers and magazines as an Iowa miracle. Much of the original route remains, though of course some has been relocated to freeways or just to safer or shorter alignments. Highway US-6 has been known by many names across the state, including Iowa 7, the White Way Highway and even US-32 before becoming US-6. Today, the I-80 freeway parallels most of it. But of course, we’re taking as much of the old road as we can find. In 1962, I-80 was still under construction so it made sense to stay on US-6 where all the tourist services and towns were located. It also makes sense to stay on the old road today for scenic reasons. And it’s easier to do so than it was just a few years ago, thanks to the efforts of the Iowa Route 6 Tourist Association. 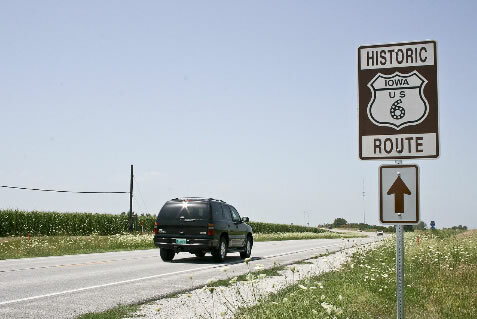 The organization has funded many “Historic Iowa US 6 Route” signs which the Iowa Department of Transportation has erected on sections of the route where the official US-6 has been relocated onto the interstate. These sections that had lost their number include where we are now, between Davenport and Wilton, Iowa. The Iowa Route 6 Tourist Association hosts two great cruises across the state on US-6, the Retro Road Trip for cars in October and another one for motorcycles in June. We’ll be looking at many of the same sites they do, but if you want to enjoy the trip in the company of other roadtrip lovers, you may wish to sign up to be part of their cruises! As US-6 takes a bend to head northwest just west of Davenport, it turns back into a 2-lane road running through farm fields and rises to leave the Mississippi River Valley. Just a few miles west in nearby Walcott, Iowa, we find the world’s largest truck stop! The Iowa 80 Truckstop was not here in 1962, but Walcott expanded that year to include US-6 out by the planned I-80 freeway. The business began as a small white enamel building selling Standard Oil products in 1964. That was still before I-80 was completed, indicating that founder Bill Moon was betting on the freeway as a good traffic source. Boy, was he right! The truckstop has had 28 expansions and remodelings and even hosts the Iowa 80 Trucking Museum nearby. Others also discovered what a great exit this was, and the location is packed with gas stations, restaurants, and motels. West of Walcott, the highway is signed somewhat erratically with various county road numbers, Grand Army of The Republic signs, and Historic US-6 signs. It keeps rolling through small towns like Stockton and Durant, Iowa, with farms between them. Durant has a small museum, the new Tri County Heritage/Genealogy Museum, but that wasn’t here in 1962, so it’s onward for us. You might find yourself driving behind one of Schwan’s 4,500 delivery vehicles out here, I did. The Schwan Food Company has been delivering food to your home since 1952, beginning with ice cream in Minnesota. Founder Martin Schwan expanded quickly to cover much of the Midwestern United States, as the concept proved popular in rural areas. The company made a number of acquisitions, mostly other dairies to allow delivery of fresh products. In 1957, they began carrying juice concentrates, and in 1962, Schwan's began selling frozen fish products. Today, they are the largest direct-to-home food delivery company and you can get nearly anything that can be frozen. My mother used to buy quite a lot from them after she retired out to Michigan’s north woods. We run alongside the railroad to the next town ahead, Wilton, Iowa. Wilton was known as Wilton Junction on the official 1962 Iowa State Highway Map. I’m not sure when they officially changed it from the older name. The Wilton Historical Society has a small museum inside the depot, usually open on weekends during the spring and summer. They also occupy some rooms on the top floor of the Gregg Free & Wilton Public Library. But the most fun reason to stop here is The Candy Kitchen! It’s easy to find, as you can’t miss the red-and-white awning and neon “Soda” sign on Cedar St. The Candy Kitchen is the oldest ongoing Ice Cream Parlor / Soda Fountain in the world, here since 1860 and still serving lunches, ice cream, and strange soda fountain beverages such as a pink lady (strawberry, cherry, and vanilla flavoring), a dipsy doodle, or a hadacol (root beer and cola). Owner George Nopoulos was 94 years old in 2014 and still shows up for work to make these treats! The store is listed in the National Register of Historic Places. I don’t know about some of those drinks, but I could sure use an ice cream this afternoon. If we were going to stay in Wilton tonight, I might try the Motel Wilton. It’s a small, 12-room motel that still looks in good shape. Comparing an old postcard to their current website photo, it looks like it was previously Pirkey’s Motel and was here long before the I-80 freeway bypassed town, so we could have stayed in 1962. Instead, I have to pass it by as we continue west. At the west edge of town, current US-6 rejoins us as we cross the Cedar River and tributaries, pass through Moscow, Iowa and Atalissa, Iowa, before arriving at West Liberty. West Liberty, Iowa is somewhat unusual for cities in this state, as it is the first in Iowa to have a majority Hispanic population. Overall, only about 5 percent of the state’s population is Hispanic. Mayor Chad Thomas notes that this unique feature is evident in many ways, such as, "Probably half of the businesses are Hispanic-owned." The change has been slow and the first surge traces back to Latino immigrants arriving in the 1930s for jobs in what was then a Louis Rich turkey processing plant. Today, most of the growth is from established families. We saw something similar back at Ligonier, Indiana, which also had a very large Hispanic population. I could not trace it back to a single event there. The turkey processing plant is still operating, though it’s now known as West Liberty Foods. Founder Louis H. Rich moved his produce company here in 1943 and within a few years operated a chicken slaughter facility. In 1949, he and his sons decided to focus instead on turkey products. The company changed their name to Louis Rich Foods in 1960 and was bought out in serial fashion by ever larger companies as the turkey business grew. Between 1979 and 1996, it was part of Oscar Mayer, General Foods, and finally Phillip Morris. Phillip Morris intended to close the plant that year, but a group of Iowa-based turkey growers formed a cooperative and purchased the plant. The new company has since expanded and now also has processing plants in Mount Pleasant, Iowa and Tremonton, Utah. Chances are good that if you have a turkey sandwich at a Subway restaurant, you are eating turkey from Iowa. The city has a number of historic sites we could visit, including Kimberly Park, which was donated to the city in 1923, several brick paved streets still in good shape, and the Rock Island Railroad Depot. The depot was constructed in 1897 and was still in use for passenger service in 1962. However, after service was discontinued in the late 1960s, the depot fell into disrepair. The West Liberty Heritage Foundation was incorporated in 1999 and was able to restore the building by August, 2001. Artifacts and memorabilia pertaining to both the railroad and West Liberty are on display. The Foundation has also added other buildings and artifacts to the adjacent former railroad yard, including a farm barn from the area, a 1930s tourist cabin from the North Point tourist stop (which consisted of a service station, cabins and a diner), and a Rock Island Caboose and other train rolling stock. All in all, it’s a nice collection of items from the area that we could have seen in 1962, in one place. The New Strand Theatre has also been around a long time, since 1910, when it was opened as the West Liberty Opera House. Besides the first floor’s use as an opera house, the second floor was used by the Knights of Pythias and Knights of Pythiasthe Pythian Sisters for their meetings. In or just after 1927, the building was changed to a movie theatre known as The Strand. In November, 1961, the manager Paul Tobias announced that it would be closed after the first of the year. At this point the Strand was showing weekend shows only. However, local sentiment and attendance was so strong that the local Chamber of Commerce kept the theatre operating until 1963, when a new lessee was found. Subsequent owners retained the weekend operation, and that’s how we find it today. The most recent owner, Todd Leach has also performed quite a lot of refurbishing, including an upgrade to digital projection and 3D, so the New Strand Theatre is ready for the future. If you were here in July, you could see the Muscatine County Fair. This fair has been held since 1852 and today it features children's activities, entertainment, music, rides, commercial vendors, and a wide variety of food and attractions. If you are not here in July, you could still stop at the fairgrounds and see the ½-mile, slightly banked, dirt track racetrack used for the West Liberty Raceway. I’m not sure when the raceway began using the track at the fairgrounds, but the pit gates open at 4:30pm when races are held, so you’ll want to stay the night. The track hosts International Motor Contest Association (IMCA) races in several different classes, including Late Models, SportMod, Modified, Stock Cars, and Sport Compacts. If you were staying the night back in 1962, you could have had dinner at the Crystal Café. This was a local restaurant attached to the Reinsager’s Shell Service Station from the late 1940s through 1985. The photo above shows about what it would have looked like if we had stopped in, but today the site is a car wash. Anyway, we need to get about 17 miles farther down the road because we haven’t really put on many miles today! After traveling through the cornfields, we arrive at Iowa City, Iowa. Here we cross US-218, which runs 319 miles from Owatonna, Minnesota to Keokuk, Iowa. The portion from south of Iowa City to Waterloo, Iowa travels jointly with the I-380 freeway. Changes were made within Coralville and Iowa City in 1957 and 1958, which included changes to US-6. The routes were moved to a newly-opened four-lane bypass between Riverside Drive and Lower Muscatine Road. Because the bypass was so new in 1962 and nothing much was yet built on it, I’m opting to drive the old road directly into downtown on Muscatine Avenue. Iowa City is the home of the University of Iowa. Their sports teams are known by the nickname “Hawkeyes” and their mascot is Herky the Hawk. Herky dates from 1948, when it was created by Richard Spencer III, a UofI instructor of journalism and named by John Franklin, a Belle Plaine alumnus. The symbol received a minor update in 1962. Hawkeyes’ home games are played in historic Kinnick Stadium, opened in 1929 and later named after their 1939 Heisman Trophy winner Nile Kinnick. Kinnick Statium ranks as one of the 20 largest college-owned stadiums in the nation, having a capacity of 70,585 fans. The Hawkeyes football team were at home in this stadium on October 6, 1962, when they were beaten by the University of Southern California Trojans, 0–7. 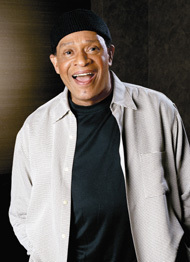 A famous University of Iowa alumnus who was here in 1962 is jazz singer Al Jarreau. He came to Iowa after graduating in 1962 with a Bachelor of Science degree in Psychology from Wisconsin’s Ripon College, where he occasionally sang with a group called the Indigos. He earned a Master's Degree in Vocational Rehabilitation here and moved to San Francisco to begin a career in rehabilitation counseling. While there, he started performing at a small jazz club with a trio headed by George Duke, and by the late 1960s, he moved to Los Angeles and began singing full time. While driving around the university campus, I might just have time to stop into the University of Iowa Map Collection. I especially want to see their Sanborn Fire Insurance Maps. They have over 1000 Iowa cities on file, for time periods mainly from the 1870s to the 1960s. Maybe I can look up information on buildings that existed in 1962! Well, the rest of the evening will have to be spent in places that do not close. I can drive around a bit before dinner, then maybe head to a park. I could buy an Iowa City Press-Citizen newspaper, the only choice in town. As I noted on the News of 1962 page, like many large cities, there is only one newspaper here due to mergers over the years. In Iowa City, two local papers merged in 1920 for economic reasons. My first choice to drive past is the Old Capitol building, because it’s located right in the center of the University of Iowa campus. Iowa City was the second capital of the Iowa Territory and the first capital of the State of Iowa. The building became the first permanent building of the university in 1857, when the capital was moved to Des Moines, Iowa. We will also see that current Capitol, a couple of days up US-6 in Des Moines. But what luck here, the Old Capitol Museum is open for tours on Thursday evenings, so we can visit after all! Many of the rooms have been restored to their appearance of the territorial years, after serving as classrooms for many years. You can visit the Treasurer's Office, Auditor's Office, Governor’s Office, both the House and Senate Chambers, and more. The Senate Chamber has long been used for a variety of public events including high school debates, concerts, PhD defenses, and lectures. The tradition has continued since the Old Capitol opened as a museum in 1976. There are also more varied, changing exhibits in several other galleries of the building. Old Capitol building, Iowa City, Iowa (Photo by Billwhittaker, from Wikimedia Commons, licensed under a Creative Commons Attribution-Share Alike 3.0 Unported license. Time for dinner, perhaps at the Ped Mall. This is the local pedestrian mall, located just off the University of Iowa campus, downtown. It occupies about three blocks, spanning from Burlington Street to Washington Street, and Clinton Street to Linn Street. The Ped Mall is a gathering place for students, locals, transients, and unfortunately, the homeless. The mall was only constructed in 1980 and there are a number of restaurants and bars, though most are too new for our 1962 tastes. Maybe I should head a few blocks away to the Hamburg Inn No. 2. The restaurant has been here since 1948, the second in a family-owned chain that only reached three locations. They are currently famous for their pie shakes: a milkshake blended with a piece of pie! They attract presidential candidates just about every election, serve breakfast all day long, and otherwise have pretty standard hamburger fare in their knotty pine “Comfort Food in a Fifties Time Capsule” atmosphere. After dinner, I’ll just take one more drive around the city before retiring. In various places around town are some small homes known as Moffitt Cottages. They look like fairy-tale, thatched cottages but were constructed from the 1920s through the 1940s by Howard F. Moffitt and his business partner, Ray Blakesley. The 100+ homes are roughly a part of the Arts and Crafts movement and including an eclectic mix of styles and materials. They usually have exteriors of stone and brick, sometimes very thick to reduce heating and cooling costs. The later houses have sawdust insulation in the outer walls, perhaps inspired by the old days when sawdust was packed around stored ice to keep it from melting in the summer. As part of the builders’ purpose was to provide affordable housing, they included salvaged wood and brick, and sometimes even reused nails. Moffitt houses can be found throughout the community, but mostly along the east side of Ralston Creek in the Longfellow Neighborhood and in the Lucas Farms Neighborhood. This should keep me busy for awhile and maybe I’ll even spot an old motel for the night. See you on Roadtrip-’62 ™ tomorrow! Moffitt Cottage home, Iowa City, Iowa (Photo by Billwhittaker, from Wikimedia Commons, licensed under a Creative Commons Attribution-Share Alike 3.0 Unported license.